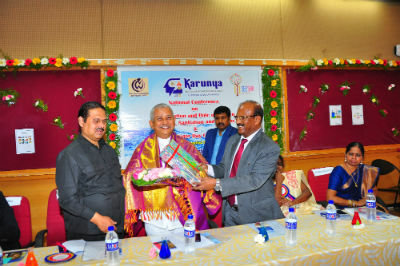 The Karunya Education and Research Trust organized the National conference on “Participation and Role of Women in Water, Sanitation and Hygiene”. Due to cultural and historic reasons, women are often the primary collectors, transporters and users of water . They are responsible for health, child care and sanitation activities. The conference was supported and sponsored by the National Commission for Women. The conference was well coordinated by SEESHA and the Karunya Institute of technology and sciences .The students and faculty contributed by participating in poster competition and presentation. The conference was inaugurated by the Chief Guest , Mr.Ramachandru Tejavath , I.A.S ( Special Representative from Telungana Govt) . He told that the Central Govt is taking intitiatives on Swach Bharat and other programs and the success lies in the implementation of the individual household women. Though we claim to have women elected representative to be part of the local self government and it lacks autonomy due to gender bias. The scenario should change to empower the women to play major role in Water , Sanitation and Hygiene. The Vice Chancellor Dr.P.Mannar Jawahar gave presidential address. Mr.D. Ramamoorthy , IFS (Retd), Director ,Karunya Education and Research Trust concluded the conference and gave valedictory address . Felicitation was given by Pro Vice Chancellor Dr.Ridling Maragaret Waller and Water Institute Director ,Dr.E.J. James.Dr.P.Jagathambal welcomed the gathering. Mr.Henry Waller ,the chief operating officer of SEESHA gave special address. The State govt steps in forging particpation of women in wash was highlighted by Mr.P.Selvarajan, The additional Director for Rural Development (ADRD), women development corporation. The role of women and community perspective was highlighed by Senior Justice Dr.I.Jeyanthi. The psycho Social distress faced by women was elaborated by Dr.A.Thirumoorthy from NIMHANS. There was also a panel discussion moderated by Mr.Henry Waller, COO , SEESHA and several speakers Dr.K.N.Vijayanthi from UNICEF,Mr.RUFUS from Ministry of Skill development and Entrepreneurship, Dr.Daisy Dharmaraj , Mr.Raji from SEESHA, Mr.Avnish Rana from Ministry of Employment , Ms.Amirtha Mathi from Gramalaya and Dr.Manoj from KITS . participated and discussed the Role of govt and NGOs and how they can arrive at a revenue model also highlighted. Mr. S.Tamil Maran ,Head, Centre for Social Outreach and the Convenor of the conference proposed vote of thanks.